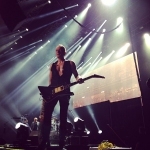 Def Leppard continued their Summer Tour 2014 last night in Mexico City, MEXICO with a longer 17 song set played. The band played an expanded 90 minute set at the Palacio De Los Deportes. The show started with the live snippet of 'Won't Get Fooled Again'. This was the first full headline show by the band since Canandaigua, NY on 17th July 2013. With the added time the band played three songs aired for the first time in 2014 - 'Action', 'Promises' and 'Make Love Like A Man'. The same basic stage setup as the KISS tour leg was used apart from a smaller back video screen. The lighting rig was similar to the one used in 2013. Action - last played on 17th July 2013 in Canandaigua, NY during the Summer Tour 2013. Promises - last played on 28th June 2013 in Santiago de Compostela, Spain during the Summer Tour 2013. Make Love Like A Man - last played on 17th July 2013 in Canandaigua, NY during the Summer Tour 2013. Coda played a short opening set in front of their home fans. The next Def Leppard show takes place on 6th September in Monterrey as part of the Monterrey City Festival.